The Hobey Baker Award, awarded annually to the most valuable player in the college hockey world, was first dished out in 1981. Since then it has been handed out to some of hockey’s biggest stars. 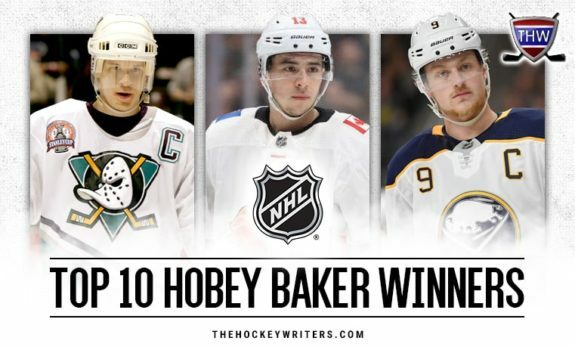 Countless winners have gone on to become elite talent at the NHL level. This article ranks the top ten winners of NCAA Hockey’s most coveted trophy since its origin. The players are ranked based on their performance in their winning season and the rest of their college days, not necessarily their post-NCAA careers. Jason Krog of the University of New Hampshire won the Hobey Baker Award back in 1999. He is the only UNH Wildcat to have taken home the trophy. The Fernie, British Columbia-native averaged a goal-per-game and gathered 33 assists in just 20 appearances in conference play that season. This contributed to his senior-year totals of 34 goals and 51 assists in 41 games. Krog led all scorers nationwide in points, goals, and assists while maintaining an average of 2.08 points-per-game that year. The centerman was also a Hobey Baker Finalist during his junior year in 1998 before finally winning it in 1999. Krog went on to play with five NHL teams including the New York Islanders, Anaheim Ducks, Atlanta Thrashers, New York Rangers, and Vancouver Canucks. 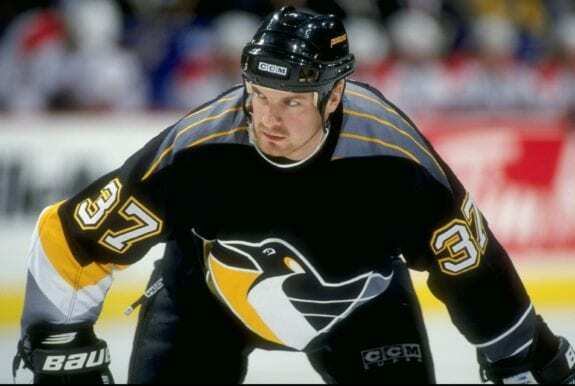 He managed 22 goals and 37 assists in 202 games in the NHL before retiring to play in Europe. Jordan Leopold was awarded the Hobey Baker Award in 2002 — one of just seven defensemen to receive the honor. During his junior year, Leopold was a 20-goal scorer adding 28 assists to tally 48 points in 44 games. He led all defensemen in the nation in scoring that year. The Golden Valley, Minnesota-native broke two Golden Gopher records with the most goals in a season (20) and in a career (45) by a defenseman. Leopold was also a finalist for the Hobey Baker during his sophomore season and was the Western Collegiate Hockey Association (WCHA) Defensive Player of the Year and a First Team All-Star two years in a row. The defenseman is also a two-time All American. Leopold played in the NHL for 12 seasons, appearing in games for nine different teams. He was eventually traded to his home state of Minnesota during the 2014-15 season, retiring with 67 goals and 214 points in 695 career games. Brendan Morrison, the first Michigan Wolverine to win the Hobey Baker Award, received the honor in 1997. The forward led the nation in regular season scoring with 88 points in 43 games during his senior year. He led his team to win the 1997 Chaska Chanhassen Hockey Association (CCHA) Title and to an appearance in the NCAA Championship game. The Pitt Meadows, British Columbia-native was also named CCHA Player of the Year two years running. Morrison holds University of Michigan records for career points (284) and assists (182) in addition to being named a Hobey Baker finalist and All-American in three consecutive seasons. As if that wasn’t enough, Morrison scored the game-winning overtime goal to win the Wolverines an NCAA Championship in 1996. Morrison went on to play 934 games in the NHL, racking up 200 goals and 401 assists with the New Jersey Devils, Vancouver Canucks, Anaheim Ducks, Dallas Stars, Washington Capitals, Calgary Flames, and Chicago Blackhawks. Johnny Gaudreau took home the Hobey Baker Award for his performance throughout his junior year at Boston College in 2014. Nicknamed ‘Johnny Hockey’ for his stellar play, the forward notched 36 goals and 44 assists in 40 games, averaging two points per contest. His 80 points that year marked the highest point total in NCAA Division I Hockey in 11 years. Gaudreau tied a Hockey East record with a 31-game point streak during the 2013-14 season. He also led the nation in goals, assists, and points. The Salem, New Jersey-native is the lone player to ever win the award from his home state. He was named Hockey East Player of the Year, a First Team All-American and was a Hobey Baker Finalist, all twice. After winning the award, Gaudreau signed with the Calgary Flames. As a pro, Gaudreau has appeared in over 370 NHL contests, registering over 125 goals and over 240 assists. Jack Eichel was the first freshman to be named a finalist for the Hobey Baker Award in 12 years upon his win. He did so in 2015 with the Boston University Terriers at the age of 18. The North Chelmsford, Massachusetts-native led the nation in both assists (44), points (70), and plus-minus (plus-51). He also netted 26 goals in his 40 appearances during the 2014-15 season. Other accolades Eichel took home include Rookie of the Year, Hockey East Scoring Champion, and First Team All American. He was also named Most Valuable Player for his performance in the Hockey East playoff tournament. The forward also captained Team USA in the World Junior Championship that season, setting the stage for the infamous comparison between Eichel and Connor McDavid. Eichel was subsequently drafted second overall by the Buffalo Sabres in the 2015 NHL Entry Draft. In 2001, Ryan Miller became the second goaltender in history to win the Hobey Baker Award. Miller’s record of 31-5-4, his goals against average of 1.32 (GAA) and 10 shutouts were the best in the nation during the 2000-01 season. Though he was just a sophomore, the goaltender set an NCAA record with a .950 save percentage (SV%). By the end of his sophomore year, Miller had tallied 18 career shutouts, another NCAA record. He added eight more during his junior year to extend the record to 26 shutouts in total. The East Lansing, Michigan-native led Michigan State to the No. 1 rank nationwide. The following season, Miller was once again a Hobey Baker Award top ten finalist and was named Goalie of the Year for the third season in a row. 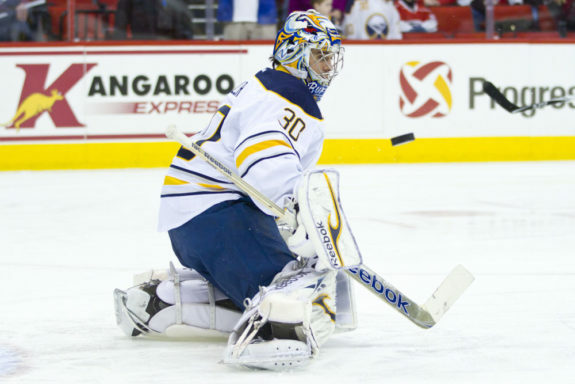 Drafted in the fifth round of the 1999 NHL Entry Draft, the now 37-year-old tallied over 30 wins in each of his first seven full seasons in a Sabres uniform and spent over a decade in Buffalo’s organization. He’s accumulated over 375 wins and 45 shutouts with the Sabres, St. Louis Blues, Vancouver Canucks, and Anaheim Ducks. He also helped Team USA earn a silver medal during the 2010 Winter Olympics. In his junior year with the University of Minnesota-Duluth, Bill Watson took home the Hobey Baker Award in 1985. The Pine Falls, Manitoba-native led the Bulldogs to WCHA regular-season titles in 1984 and 1985, being awarded the league’s Most Valuable Player in the latter year. Watson broke a number of UMD records including 49 goals, 60 assists, and 109 points in his Hobey Baker season. He also broke a school record with points in 33 consecutive games that year. Watson was drafted in the fourth round of the 1982 NHL Entry Draft by the Chicago Blackhawks whom he appeared in 115 NHL games with, spanning four seasons. He netted 23 goals and registered 36 helpers in his NHL career. The forward went on to become an assistant coach for Western Michigan University for three seasons before holding the same position with UMD from 2006 to 2014. Kip Miller capped off his college hockey career with a Hobey Baker win in 1990. The Michigan State senior put up 48 goals and 53 assists in 45 games, leading the nation in scoring for the second year in a row. He was also deemed a two-time All American for his performance across those two seasons. Miller led the Spartans to conference titles in 1989 and 1990, taking home the accolade of CCHA Player of the Year in the latter year. The Lansing, Michigan-native was drafted by the Quebec Nordiques in the fourth round of the 1987 NHL Entry Draft. His NHL career consisted of 449 games in which he scored 74 goals and registered 165 helpers. Tony Hrkac set an NCAA record for most points in a season leading to a Hobey Baker win in North Dakota – as a sophomore. The forward’s 116 points (46 goals and 70 assists) in just 48 games that year remains a college hockey record to this day. He led North Dakota to WCHA Titles in 1986 and 1987 and helped the Fighting Sioux win the national championship during his Hobey Baker season. Hrkac was subsequently named the tournament’s Most Valuable Player. The Thunder Bay, Ontario-native went on to register 64 goals and 106 assists in his college career spanning 84 games. Hrkac was drafted 32nd overall by the St. Louis Blues in the 1984 NHL Entry Draft. He went on to play for nine NHL teams, posting 132 goals and 239 assists in 758 games. Paul Kariya was the first freshman to win the Hobey Baker award and did so with the University of Maine in 1993. The Vancouver, British Columbia-native notched 25 goals and a whopping 75 assists in 39 games. He helped lead the Black Bears to an NCAA and Hockey East title that season — the first of just two times the program has ever claimed the peak of the college hockey world. Kariya also broke a Hockey East record with a 23-game scoring streak during his Hobey Baker season. 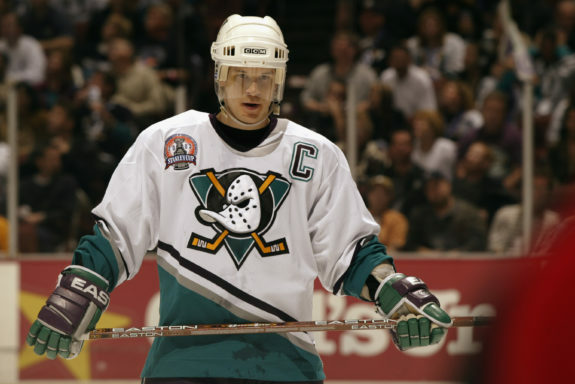 The following year, Kariya helped Team Canada take home a silver medal at the 1994 Winter Olympics. The Anaheim Mighty Ducks drafted the winger with the fourth overall pick of the 1993 NHL Entry Draft. He won the Lady Byng Memorial Trophy during his sophomore and junior seasons, racking up 402 goals and 587 assists, solidifying himself as a point-a-game player with 989 points in as many games.